Exploring and living in cities like New York, Tokyo, Hong Kong, and San Francisco, Holden grew an affinity for urban living, where walking is an integral part of everyday life. He believes in the future of Kakaako and the vision of its master plan – a true walkable, live-work-play community. Holden was born and raised in Honolulu, Hawaii, and is a graduate of Roosevelt High School and the University of Hawaii at Manoa. Shortly after college, he found his passion for real estate and helping clients buy and sell homes. 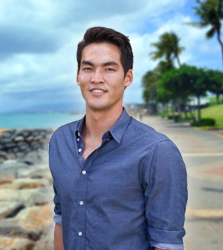 A realtor-associate at Coldwell Banker Pacific Properties, Holden has won many awards including two awards at the Ward Village Broker Awards Gala including Top Agent by Number of Homes Sold in Ward Village in 2016 and Top Producing Agent by Revenue in Ke Kilohana in 2016. When it comes to buying a property, it is important that you put yourself in the hands of a real estate agent who will focus your best interest and understand your needs. From the emotional aspect of buying your first home to the complexities of buying a self-sustaining investment property, Holden understands every facet of home ownership.With a large network of professionals and colleagues, he will provide guidance through each step in the real estate process.